Before she became the nineteenth century's greatest heroine, before he had written a word of Madame Bovary, Florence Nightingale and Gustave Flaubert traveled down the Nile at the same time. 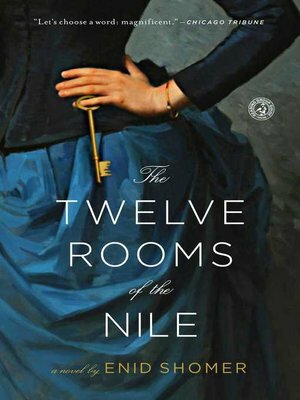 In the imaginative leap taken by award-winning writer Enid Shomer's The Twelve Rooms of the Nile, the two ignite a passionate friendship marked by intelligence, humor, and a ravishing tenderness that will alter both their destinies. In 1850, Florence, daughter of a prominent English family, sets sail on the Nile chaperoned by longtime family friends and her maid, Trout. To her family's chagrin--and in spite of her wealth, charm, and beauty--she is, at twenty-nine and of her own volition, well on her way to spinsterhood. Meanwhile, Gustave and his good friend Maxime Du Camp embark on an expedition to document the then largely unexplored monuments of ancient Egypt. Traumatized by the deaths of his father and sister, and plagued by mysterious seizures, Flaubert has dropped out of law school and writ-ten his first novel, an effort promptly deemed unpublishable by his closest friends. At twenty-eight, he is an unproven writer with a failing body. Florence is a woman with radical ideas about society and God, naive in the ways of men. Gustave is a notorious womanizer and patron of innumerable prostitutes. But both burn with unfulfilled ambition, and in the deft hands of Shomer, whose writing The New York Times Book Review has praised as "beautifully cadenced, and surprising in its imaginative reach," the unlikely soul mates come together to share their darkest torments and most fervent hopes. Brimming with adventure and the sparkling sensibilities of the two travelers, this mesmerizing novel offers a luminous combination of gorgeous prose and wild imagination, all of it colored by the opulent tapestry of mid-nineteenth-century Egypt.